It is with a big ol' smile that I tell you that my nails are over on FashionPolish.com today! Check out my creepy splatter manicure over on Sam's blog. That looks great! Definitely making me want to give it another try. 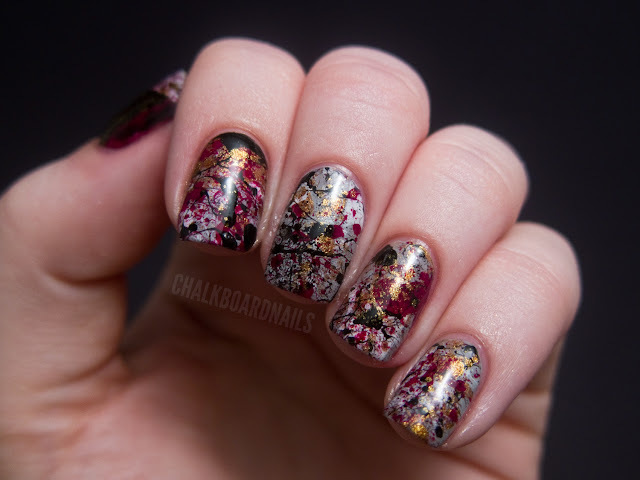 I have seen your nail art by Fashion Polish and I love it. It is sooo awesome <3. Best splatter nails I've seen! I saw the guest post and I immediately went to your blog to follow you and to right now tell you that this is awesome and all your other posts are amazing too! So AWESOME. One of my favorites of yours! This I think is my favourite one of yours. so amazing! Wow! this looks pretty.. its having feel like emboss painting. The first time I saw this kind of nails is on my daughter's. Of course as a parent you'd be damned to see such. Yes I am culture shocked,but I got the hang out of it. She works part time in a salon and she do nail art. I was fascinated on how she do them nails.She even got her mother hooked on nail art. What can I say, all I know is jewelries.